The date has been fixed for Europe's daring attempt to land on a comet: Wednesday 12 November. It will see the Rosetta satellite, which is currently orbiting the huge "ice mountain" known as 67P, drop a small robot from a height of 20km. If all goes well, the lander will free-fall towards the comet, making contact with the surface somewhere in a 1km-wide zone at roughly 15:35 GMT. The European Space Agency (Esa) says the challenges ahead are immense. Imagine pushing a washing machine out the back of an airliner at twice cruising altitude and expecting it to hit Regent's Park in London - all while the ground is moving underneath. Although not really analogous for many reasons, this scenario does give a sense of the difficulties involved. The chances of failure are high. Esa's confirmed date is actually a day later than the one that had been discussed in provisional planning in recent months. The extra time will give flight controllers a bit more latitude as they try to get Rosetta into just the right position to deliver the 100kg lander, which goes by the name of Philae. This requires careful "phasing" of Rosetta's path around 4km-wide 67P so that the satellite turns up at the precise, pre-determined ejection point, 22.5km from the centre of the comet at 08:35 GMT. Because the whole event will be taking place 509 million km from Earth, any radio signal will take 28 minutes and 20 seconds to reach Esa's ground station network. It means confirmation of success or failure will not come until perhaps just after 16:00 GMT. The chosen landing site is on the "head" of the rubber-duck-shaped comet and is currently referred to simply as "J", the designation it was given in a list of possible destinations in the selection process. It is far from ideal. It contains some terrifying cliffs, but is the flattest, most boulder-free location the mission team could find in its survey of the icy object. Mapping of J and a back-up site known as "C" is ongoing. This past week, Rosetta manoeuvred into an orbit just 20km from 67P, enabling its camera system to see details that can be measured on the sub-metre scale. For landing, such information only has a certain usefulness, however, as the automated touchdown can only be targeted with a best precision that will likely run to hundreds of metres. And that error is larger than any of the apparently smooth terrains in the J zone. The whole separation, descent and landing (SDL) procedure is expected to take seven hours. 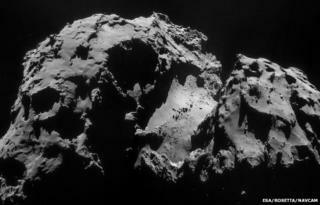 Philae will take a picture of Rosetta as it leaves its "parent". It will also point a camera downwards so that it can see the approaching comet. Not that this information can change anything; Philae has no thrusters to control or alter its descent trajectory. It will land where it will land. But the images will help controllers determine where the robot ended up after the event. If Philae gets down successfully into a stable, operable configuration, it will fire harpoons and deploy screws to try to hang on to the surface. The action of these devices will tell Esa mission control in Darmstadt, Germany, that the surface was engaged. Will it hang on? Part of the problem here is that no-one really knows what the surface conditions will be. Philae could sink into a soft powder or impact ice as hard as rock. A major worry is that it could simply bounce off into space. Whatever the outcome, the Rosetta mission will continue. Already the main satellite has returned some astonishing pictures of Comet 67P and the close-quarters observations it will conduct over the next year will transform our understanding of these remarkable objects. The timings mentioned on this page carry some uncertainty and would change if subsequent mapping shows the J site to have a major problem, with Esa forced to shift its attention to the back-up destination, C.